GaryMoller.com - Health, Fitness - Naturally! 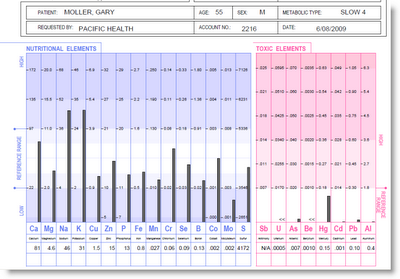 : How a Hair Tissue Mineral Analysis (HTMA) Intervention typically pans out. How a Hair Tissue Mineral Analysis (HTMA) Intervention typically pans out. HTMA Charts left: Gary Moller before and ongoing - mercury down while excess soft tissue calcium is now being excreted by the truck load. When you send in your hair sample, it is first handled by Pacific Health of Auckland, NZ. It is couriered to ICL Laboratories in Sydney, Australia where your details are entered into their database and the sample checked for integrity. The most common fault is not enough hair. The hair is then repacked and sent by courier to ICL's parent laboratory in the USA where it is divided into three samples. Using the most sophisticated testing technology available, the "A" sample is burned in a vacuum using a plasma flame. The light emitted by individual atoms as they are excited is detected by a mass spectrometer. It is very accurate indeed! If the result is outside of normal boundaries (Excess mercury for example) then the "B" sample is burned and results compared, as will be done with the "C" sample, if necessary for assurance of accuracy. If results are "abnormal" a further hair sample may be requested for verification. This is usually done at no extra charge to the patient. The raw data is then transmitted to ICL in Sydney where it is analysed by a biochemist with specialist training in the interpretation of this information. The subsequent report is then transmitted to Pacific Health in Auckland where it is printed out and bound. A copy is sent to the patient and a copy, along with a Doctor's Report is sent to me. We arrange to meet, face-to-face, by phone or by Skype - Depending on where you live. During this meeting, we review the report's findings and relate them as closely as possible we can to your actual personal situation. There usually are changes to one's diet, based on metabolic typing (The HTMA indicates your metabolic type) and there are usually some quite specific minerals and vitamins to be taken. The actual type and number depends entirely upon what is found in the HTMA and can vary from 2-3 different types to as many as 6-10 in extreme cases of need. The HTMA is the method of choice to find out if a person has been exposed to toxic elements such as mercury, lead, arsenic and even uranium. While the half life of a toxic element may be as long as 10-15 years, the blood is cleared of these within days of exposure. 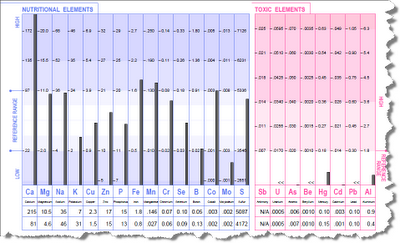 The HTMA, on the other hand, can detect toxic element exposures many years ago. If one or more toxic elements are found, the next step is to identify if there is any ongoing exposure, such as via contaminated water supplies (copper/iron), underarm deodorant (aluminium) or hair dye (lead) for example. A blood test may assist this search. Along with eliminating any sources of ongoing contamination, the process of safely chelating any toxic elements from the body begins. This is done through the use of various vitamins, minerals and carotenoids. Repeat testing will guide the process of decontamination. Although every person differs in need, the general rule of thumb is to do the dietary changes and supplementation for three months, sticking as close to the plan as practical. This includes weekly check-ins with me to ensure that all is going to plan and to make adjustments as we go. So long as this is not too demanding of time, there will be no charge for my time. From about three months, we usually run any supplementing right down to perhaps a maintenance dribble that may consist of ICL Algotene, Himalayan Sea Salt and maybe one or two other items, if needed. This will be maintained for a further three months at which time (Six months in total) I recommend that you repeat the HTMA so that we can measure your progress as well as determine what, if any, further intervention is required. This evidence based approach takes much of the guesswork out of nutrition and lifestyle interventions. Participants can expect gradual improvements in health status and, in some cases, marked improvement in chronic health conditions ranging from dermatitis to chronic fatigue to irritable bowel syndrome, to name just a few. Isn't the hair tissue mineral analysis really professional quackery? Well it may be if it is a strand of hair that is analysed by swinging a pendulum above it. The ICL HTMA is scientifically robust and highly accurate. It is conducted by an FDA certified laboratory and managed by qualified biochemists. The ICL HTMA will stand scrutiny in any court of law where it is a highly respected forensic test for determining levels of toxic contamination from sources such as industrial pollution. Most of the internet postings that claim this testing to be quackery are dated - some more than 10 years ago. The technology has advanced in leaps and bounds in recent years and continues to improve. Technology does not stand still. There is pressure from some interest groups to discredit this test. Scientists may be "encouraged" by polluting industries to discredit this test because it is the most accurate method for determining if a person or persons have been poisoned by a pollutant like lead or mercury from a dirty factory or dump site, for example. The polluter much prefers a blood test because it will only show recent exposure and not exposure that could have happened many years ago. The HTMA can accurately detect past exposure. The HTMA tells a person what he or she can do to help themselves in terms of diet, nutrients and lifestyle to take control of their health. There is no role at all from the HTMA for pharmaceutical drugs that induce passive dependency at great long term cost to the individual and the tax payer. The HTMA is the most valuable tool for assisting a person with getting off pharmaceutical drugs. There are powerful vested "interests" that do not like this. Will the HTMA programme interfere with my medication? The answer is a definite "No!" The dietary changes do not affect medications other than perhaps reducing your need. When prescribing any nutritional supplements, I take careful account of potential interactions and adjust accordingly. As the weeks and months pass and the HTMA programme takes effect, the need for medication such as antidepressants and blood pressure pills usually becomes less and dosages may be reduced or even stopped. You need to consult your doctor during this process. If you are under the care of a medical/health practitioner and/or on medication, it is best that we all work collaboratively to ensure you have the best outcomes. So please share your HTMA report with your healthcare providers. Despite its scientific robustness, I am not aware of any medical doctors in New Zealand who use the ICL HTMA as part of their medical services and none have participated in the training courses while I have attended. While there will surely be some who use the HTMA, the real numbers must be very disappointing. I am aware of several doctors who have rubbished the HTMA test before their patients without even looking at the report. We don't want that happening with you, so please tell your doctor that she/he is most welcome to call me and I will explain the report's findings and address any concerns because it does require some specific training to be able to properly interpret and apply these tests. $225 for the Profile 2 which includes reviewing the results with me. Any supplements based on what turns up is highly variable and optional but usually highly recommended if there is to be a definite turnaround in health for the better. Generally, this may be from $1-300 with top-ups of any that are running low about monthly. This really does depend on the person and the complexity and degree of any health issues. If you want a HTMA, send me your mailing address and I will send you the forms. You pay the lab direct, or you can pay for it via my website store.